Here is our new ArcTools package designed to facilitate ClockworkMod (CWM) Recovery system installation on your device. This should work on most Rockchip devices running RK3066 or RK3188 processors. We haven't yet written documentation for this CWM installation process but the video below shows the main steps. If anyone wants to help the community with the documentation, feel free to post here. If you are running an Android 4.4.2 (KitKat) firmware on your Rockchip device, we recommend using this package: "iFive X2 Android 4.4.2 CWM Recovery by ManuPC". Thanks ManuPC for providing this recovery image. The "iFive X2 Android 4.4.2 CWM Recovery by ManuPC" that is listed above is a good option for anyone looking for a ClockworkMod (CWM) Recovery on a RK tablet running KitKat. Still it has limitations such as not being able to support sdcard for storage. "(OMA / CrewRKTablets) CWM Recovery 6.0.3.1 for Android 4.4.2 KitKat on RK tablets (loader Gen2)". 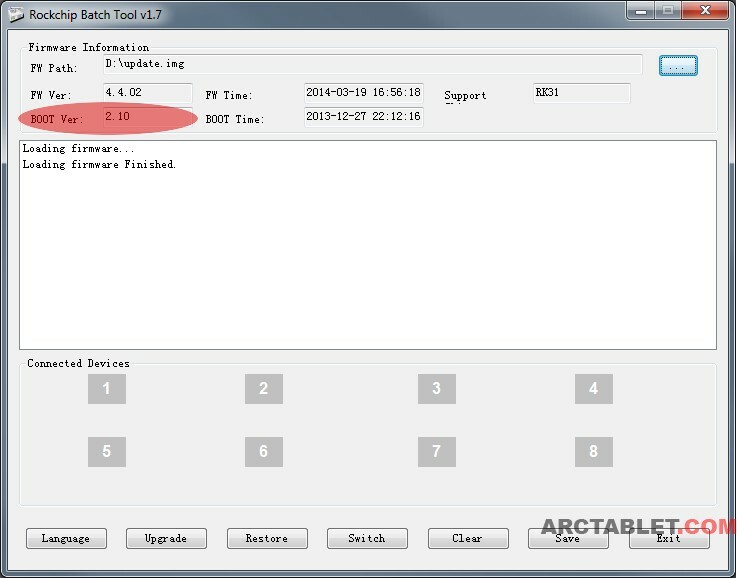 (the number shown in Rockchip Batch Tool should be 2.something). To our knowledge, no manufacturer have provided KitKat firmwares based on a Rockchip loader, there are only a few custom firmwares from independent developers such as Crew RKTablets. Controls are done thru hardware buttons on your tablet : Vol-/Vol+ to go up and down, power button to validate choices. For tablets without these hardware buttons, you can either use a keyboard/mouse connected to your tablet using an USB OTG (Other the Go) cable, or use gestures on the touchscreen: touch and move up to select up, touch and move down to select down, swipe left to accept or swipe right to go back. (NEW!) 2015/01/09: TWRP/CWM Flash-Tool and root for RK3288 devices by Oma7144 & Crew RKTablets, check this topic. The usual disclaimer applies: our application and CWM package come with no warranty for any use; you use it at your own risk. Make sure you first have a backup of your data before testing firmwares or recovery procedures. Thanks to fun_ from androtab.info, ManuPC and OMA (Crew RKTablets) for their CWM Recovery build. worked great on my PiPo M9 pro WiFi with Riley Rom 1.7b. Eyes must be getting bad, can not see the link to download the app. Where is it? I think you just open this page in the browser: http://www.arctablet.com/blog/downloads/tools/arctools/com.arctablet.arctools.apk/, then click on link and install. That seems to get me version 0.80, where is the new one? For those who don't have it pre-installed in their firmware, I've added ArcTools download link in post #1, latest version is currently 0.80. Tks for the good work. Very nice, Thank you! Works fine on Cube U35GT2 with Kasty 4.1.1. Works great, Tks so much. Works very feine on my U30GT2 with 2.06 and Kernel 38 1.8GHz Mod. Thank you. Worked fine for me on U30GT2 with 2.04 kasty.